Last night, I made Spanish Rice for dinner as I had planned when I wrote up my weekly menu plan. However, the recipe didn’t go as expected. Since I didn’t read it beforehand, I didn’t realize I needed cooked brown rice. At 4 o’clock in the afternoon, that wasn’t going to happen. I did have cooked white rice left over from a weekend dinner. I also didn’t have any crushed tomatoes left in the pantry, though I had a jar of organic salsa left over from our First Communion Party in May. In the best of all worlds, I would have made this recipe completely from scratch. This time, I used what I had including a pepper from the garden and bottle of salsa from the pantry which would have sat for another few months until the next family party. Saute the onion and pepper in the coconut oil in a deep skillet or pot. 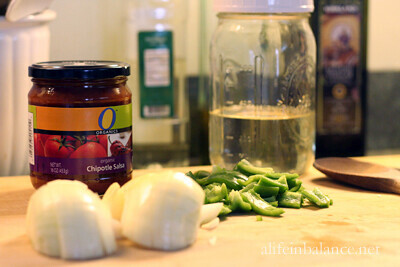 Pour the jar of salsa into a large measuring cup. Filling the now empty jar about half way with water, swish the water around in the jar and pour it into the measuring cup. Mix the water into the salsa until it is thinner. Add the thinned salsa to the skillet, watching for splatters. Add the cooked rice and stir to combine. Yum! 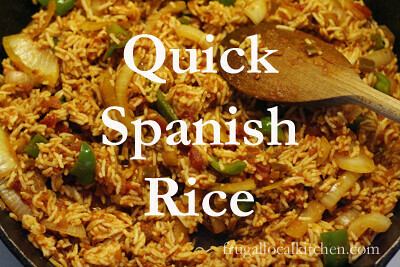 I love Spanish rice and I really like quick and easy! Alea @ Premeditated Leftovers recently posted..The Fastest, Easiest, Crispiest Hash Browns Ever!